Ear piercings are here and aren’t going anywhere. They’ve never fallen out of fashion since they’ve entered the daily looks of many women. 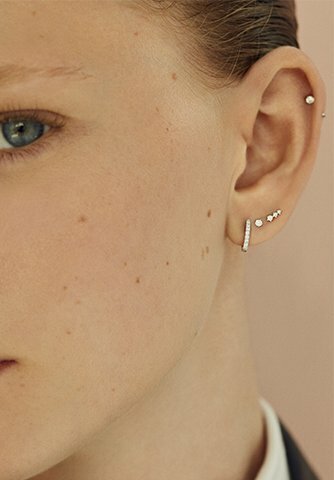 The trend now is the more the merrier, something possible thanks to the different options there are: earlobe, helix, daith or tragus… Choose where in your ear your want to wear a piercing jewel from Aristocrazy, the first Spanish brand to do piercings with jewellry: 18 kt gold, so it can be used as a fist time jewel, with hand set diamonds. Discover the new Aristocrazy piercings, jewels with personality, just like you. Earlobe or cartilage? The options to get an Aristocrazy piercing in your ear cartilage are varied, it depends on your taste and personality: heliz, daith, rook or tragus are some of them. Jump on board with the multiple piercing trend with jewels from Aristocrazy. We’ll explain each type of piercing and suggest some jewellry for it. Aristocrazy’s piercings are made of 18 kt gold, which allows to include special closures that adapt to your anatomy like the tube system of the invisible hoop closure. Choose an 9 kt jewel for the piercings you already have, or 18 kt for a new one. It’s the most common place for a new piercing, birth earring are located here. It you’re thinking about getting your first piercing, high earlobe, located higher than the original earlobe earring, is the ideal place. It’s a discreet but stills demonstrates personality, like the Asana jewels, white gold piercings with diamonds. Choose the drop-shaped earring and let it speak for you. If you already have an earlobe piercing, or want a completely different look, go for a cartilage piercing. The helix is placed on the upper part of your ear, along the outer cartilage and can be of three different types, depending of the height. If you already have a piercing there, try something new with a white 9 kt gold diamond piercing. Gold’s resistance allows for different types of closure to adjust to different type of piercing, like the screw clasp for this cartilage jewel. This piercing is located in the inner cartilage, in the border that joins the central part of our ear. The latest additions to the Aristocrazy piercing collection redesign the hoop in rose 9 kt gold with eight diamonds and an invisible closure system, jewels for your daith that will connect with your innerself. There’s a part of your inner ear that not everybody has, here is where you place the rook piercing. An area that is a little bit more painful, as the cartilage here is thicker. Choose from the Goldie piercing collection wear a heart, star of drop shaped motive. 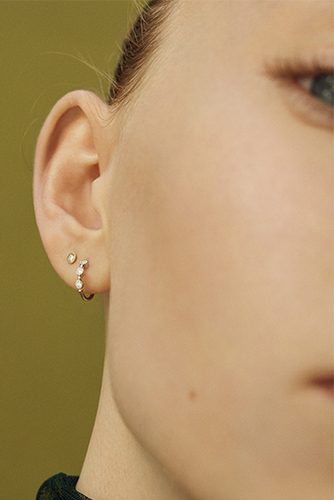 The tragus piercing can be found in the centre of your ear, in the area between your face and inner cartilage. For this special area, Aristocrazy suggests the Goldie collection hoops in yellow gold, rose gold or white gold. Once you’ve chosen the area or areas of your ear, it’s time to shose the jewel you’ll wear. Aristocrazy brings new additions in yellow and white gold where diamonds can still steal the spotlight. Combine them as you wish, search for harmony and remember that the Aristocrazy piercings are your allies to express your personality.